Pro-Fusion offers both Micro-TIG and Micro-Plasma weld processes from a single power supply. System offers reliable arc starting and exceptionally stable arcs at ultra low current levels (0.1 amp) in manual or automatic operation. 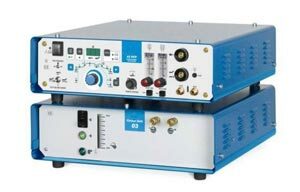 An ideal system for small part welding, the Dual Arc 82 allows high quality, low heat, precision arc welding as an alternative to costly laser or electron beam welding systems.